The Argentine Automobile Club building. The Argentine Automobile Club building its national headquarters of ACA located in Palermo neighborhood in Buenos Aires. The building is designed in the Rationalist style by local architect Antonio U. Vilar and collaborators Alejandro Bustillo, was completed in 1942. on Buenos Aires' Avenida del Libertador. The building and its automobile museum are Palermo neighborhood landmarks. Notable cars in the museum. Colegiales is a barrio or district in Buenos Aires, Argentina. It is located between Alvarez Thomas av and this neighborhood offers a vast amount of contrast and opportunities. There are large and tall buildings that go from the Crámer street to Avenida Cabildo and this district has become a busy one with lots of pedestrians and cars that go about on the streets. The history of Colegiales is the same as the barrio of Chacarita because it used to be called Chacarita de los Colegiales and this neighborhood had chacras and quintas, where the Jesuits hosted retreats with their students. When this order was expelled in 1767, the lands were expropriated by the Spanish Crown, beginning with the government of Bernardino Rivadavia in 1826, workers and immigrants from Europe settled in the area that became the two neighborhoods of Chacarita and Colegiales. In this district the Club Atlético Colegiales developed, a club that plays in the regionalized third tier of Argentine football. Today, however, it is in the city of Munro, Colegiales is one of Buenos Aires smallest districts. Its main thoroughfare is Federico Lacroze avenue, where most neighborhood traffic, Alvarez Thomas avenue is a study in contrasts, lined with single-family rowhouses along one side and almost entirely with apartment blocks along the other. The avenue separates Colegiales with its neighbor to the south, the Pasaje General Paz attracts visitors near and far, with its mature trees, bridgepath streams and ornate, balconied Andalusian-style patio. The Colegiales Athletic and Social Club is probably the favorite social venue. Located on 2860 Teodoro García Street, it was famous in decades past for Roberto Polaco Goyeneches frequent Tango recitals there, Colegiales was home to the citys first cinema, Las Familias. The cinema was probably better-known, for the people who had it built than for its distinction as a historical first, though now a distant memory, the colorful Anselmis entertained generations of locals with their namesake circus on Lacroze and Cabildo Avenues. Today, none of these establishments exist, as they shut down or relocated to the more upscale Belgrano. From its inception, the city of Buenos Aires had a problem accommodating large cargo ships, as per Puerto La Boca, because the shallow river did not allow for direct docking. Instead ships were moored away from the shore and passengers and merchandise were unloaded onto barges and ferries for transport to the pier, in 1882 the national government contracted the local businessman Eduardo Madero to take charge of the construction of a new port which would solve these problems. Construction began in 1887 and was completed in 1897, although the installed fittings had been partially operative some years before completion of the port. It was a project and an engineering landmark at the time. His plans resulted in the Puerto Nuevo, still operating today, the New Port of Buenos Aires was completed in 1926, making the existing Madero docks superfluous. Though these continued to serve in ancillary port functions, the zone gradually decayed, becoming one of the citys most degraded areas, having as objective the urbanization of the area, the federal and city governments participated as egalitarian partners. The 170 hectares of the place had overlapping jurisdictions, the General Administration of Ports, Argentine railroads, today one of the trendiest boroughs in Buenos Aires, it has become the preferred address for growing numbers of young professionals and retirees, alike. Increasing property prices have generated interest in the area as a destination for foreign buyers, the neighborhoods road network has been entirely rebuilt, especially in the east side. The layout of the east side consists currently of three wide boulevards running east-west crossed by the east sides main street, Juana Manso Avenue, the layout is completed with some other avenues and minor streets, running both east-west and north-south, and by several pedestrianised streets. Every street in Puerto Madero is named after women, Puerto Madero currently represents the largest urban renewal project in the city of Buenos Aires. Having undergone a revival in merely a decade, it is one of the most successful recent waterfront renewal projects in the world. The Obelisco de Buenos Aires is a national historic monument and icon of Buenos Aires. Located in the Plaza de la República in the intersection of avenues Corrientes and 9 de Julio, construction began on March 20,1936, and it was inaugurated on May 23 of the same year. It was designed by architect Alberto Prebisch at the request of the mayor Mariano de Vedia y Mitre, for its construction, which cost 200,000 pesos moneda nacional,680 cubic meters of concrete and 1,360 square meters of Olaen white stone from Córdoba were used. The obelisk was built by the German company G. E. O. P. E, - Siemens Bauunion - Grün & Bilfinger, which completed its work in a record time of 31 days, with 157 workers. The rapid hardening Incor cement was used and was built in sections of 2 meters to facilitate the dumping of concrete. Its height is 67.5 m, and 63 m of these are up to the initiation of the apex, which is 3.5 by 3.5 meters. The tip is blunt, measuring 40 centimeters and ends in a rod that can not be seen because of the height. It has only one entrance and on its top there are four windows, on February 20,1938, Roberto María Ortiz succeeded Justo and appointed Arturo Goyenche as the new mayor of the city. In June 1939 the City Council sanctioned the demolition of the Obelisco, where the Obelisco stands, a church dedicated to St. Nicholas of Bari was previously demolished. In that church the Argentine flag was hoisted for the first time in Buenos Aires,1812. That fact is noted in one of the inscriptions on the side of the monument. When the slabs were removed, a legend that said Its architect was Alberto Prebisch was removed, in 1973, it was decorated as a Christmas tree. In 1975, during the Peronist government of Isabel Martínez de Perón, although it was allegedly geared against motorists creating excessive noise, it was widely interpreted as a statement calling Argentines to refrain from expressing their political views. Throughout its history, the monument has suffered vandalism, especially politically oriented graffiti, in the 1980s, an activist group broke in and spilled paint from the top windows, causing the city government to erect a fence around its base in 1987. Torre Monumental and before 1982 Torre de los Ingleses is a clock tower located in the barrio of Retiro, Buenos Aires, Argentina. It is situated in the Plaza Fuerza Aérea Argentina next to the Rua San Martín and it was a gift from the local British community to the city in commemoration of the centennial of the May Revolution of 1810. After the Falklands War in 1982, the tower was renamed Torre Monumental, although the centenary monument was initially considered to be a column it ultimately took the form of the tower. The tower was built by Hopkins y Gardom, with materials shipped from England such as the white Portland stone, the technical personnel responsible for the construction came from England. The sudden death of King Edward VII on May 6,1910, prompted the United Kingdom to cancel its delegation to the Centenary celebrations, and the cornerstone was not laid until November 26. Other delays that followed were due to the late vacationing of the gas company that was installed in the square in 1912 and the outbreak of World War I in 1914. The tower is built in Palladian style, the building is decorated with symbols of the British Empire and features the thistle of Scotland, the English rose, the Welsh dragon, the tower reaches a height of 75.5 m and has eight floors. There are clocks at the 35 m level, and the bells were designed in imitation of the ones at Westminster Abbey, the tower is topped by an octagonal copper roofed cupola. Above the entrance there are the shields of Argentina and Great Britain, bitterness over the defeat in the Falklands War triggered vandalism against the clocks at the time, and a dynamite explosion at the base of the tower, in November 1984. During the government of Mayor Fernando de la Rúa, the tower underwent extensive restoration, public access was restored and a glass lift to the 6th floor, utilising the original British machinery, was opened. In 2006 the building was closed to the public for technical maintenance, official site Photo gallery of the Torre Monumental Datasheet at Towerclocks. The Libertador Building is a government building in Buenos Aires, housing the Ministry of Defense. Seeking to remedy this, President Agustín Justo ordered the construction of a new War Ministry, pibernats plans, submitted in 1935, called for twin buildings east and west of the presidential offices at the Casa Rosada. Ultimately, these plans were dropped in favor of imposing new headquarters on a 3 ha lot east of the Casa Rosada. Designed by Ministry of Public Works architects Enrique Lopardo, Néstor Pastrana, and Héctor Campini, the structure, designed in French Renaissance style and begun in 1938, was equipped with Siemens elevators and communications networks, whose installation was overseen by German engineers. President Juan Perón renamed the landmark the Edificio Libertador in 1950 to honor the centennial of the death of General José de San Martín. Perón returned to power in 1973, but his break with erstwhile supporters, Defense Minister Nilda Garré ordered the departure of a Technical Cooperation Mission from the United States Armed Forces on April 20,2009. Caballito is a barrio of the Argentine capital, Buenos Aires. It is the barrio in the administrative division Comuna 6. It is located in the centre of the city, limited by the following streets and avenues, Rio de Janeiro. The name is said to come from the weather vane from a local pulpería. 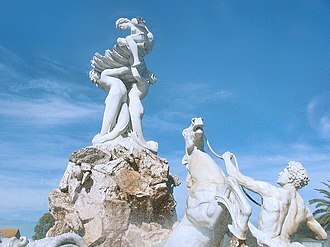 Opened to the public in 1910, Parque Centenario was so christened in honor of the anniversary of 25 May 1810. The park, in 2006, underwent extensive refurbishment, as well as the installation of a lake in replacement of the two existing smaller ones. Neighbourhood commuters are served by Underground Line A, opened in 1913 as the citys first Underground line, the neighbourhood has a long historical connection with the Underground, since it is the site of the Polvorín Workshop, where the lines famous La Brugeoise rolling stock was repaired. The workshop is now the site of the Buenos Aires Heritage Tramway, there is the Sarmiento Line, a commuter rail service which takes passengers westward to Greater Buenos Aires or eastward to Once railway station and closer to the city centre. Palermo is a neighborhood, or barrio of the Argentine capital, Buenos Aires. With a total area of 17.4 km2, Palermo is the largest neighborhood in Buenos Aires, as of 1991 it had a population of 256,927 inhabitants. It is the only barrio within the division of Comuna 14. The name of the district is derived from the still-existing Franciscan abbey of Saint Benedict of Palermo, Saint Benedict the Moor lived from 1526 to 1589 and is a complementary patron saint of Palermo, the capital city of Sicily. Juan Manuel de Rosas built a residence there which was confiscated after his fall in 1852. The most upmarket part of Palermo, Palermo Chico, is on Palermos north-eastern edge, across Figueroa Alcorta Avenue, once a quarter full of splendid mansions set in broad private parks, many have unfortunately since been demolished by developers. The area nevertheless remains one of the wealthiest in the city, home to luxury condominium and apartment developments, MALBA, is located next door between Barrio Parque and the Paseo Alcorta shopping centre. Alto Palermo is downtown Palermo, the shopping area and transport hub around Santa Fe Avenue. Centered on Las Heras Park and the Alto Palermo Shopping Center, Palermo Norte is located along Libertador Avenue to the northwest of Palermo Chico, and the site of landmarks such as the Argentine Automobile Club and the National Museum of Decorative Arts. Villa Freud, based around Plaza Güemes, is an area known for its high concentration of psychoanalysts and psychiatrists. The King Fahd Islamic Cultural Center was built in the 1990s just east of the Polo fields, the Regiment of Mounted Grenadiers headquarters and other military installations, such as the Central Military Hospital and the Military Geographic Institute, are located to the south. La Imprenta, west of Las Cañitas, borders the Belgrano ward, one of its best-known landmarks is the Parish of San Benito Abad and the neighboring Solar de la Abadía shopping gallery. Palermo Viejo is, as its name implies, the oldest part and it runs from Santa Fe Avenue south to Córdoba Avenue, and from Avenida Dorrego east to Coronel Díaz Street. The Buenos Aires Metropolitan Cathedral is the main Catholic church in Buenos Aires, Argentina. It is located in the city center, overlooking Plaza de Mayo, on the corner of San Martín and Rivadavia streets and it is the mother church of the Archdiocese of Buenos Aires and the primatial church of Argentina. The Cathedral of Buenos Aires was rebuilt several times since its origins in the 16th century. The present building is a mix of styles, with an 18th-century nave and dome. The interior keeps precious 18th-century statues and altarpieces, as well as abundant Neo-Renaissance, during the definitive foundation of Buenos Aires by Juan de Garay in 1580, part of a block facing the main square was reserved for the major church of the town. This is still the location of the current Cathedral, which is the last building in a series of churches that occupied the site. At the time of its foundation, the town depended on the diocese of Asunción, the first main church of Buenos Aires was a modest building made of wood and adobe, and was replaced by a new one in 1605 by Governor Hernandarias. This second building was in danger of collapse by 1616 and had to be rebuilt again, in 1620, Buenos Aires was made seat of a bishopric by Pope Paul V. Its main church now had the status of a cathedral, after 1662, the cathedral was again rebuilt under bishop Cristóbal de la Mancha y Velazco and governor José Martínez de Salazar, being re-inaugurated in 1671. The cathedral now had three naves covered by a roof and a tower. Due to the bad quality of its materials, the tower. The whole church was rebuilt, starting in 1684, under bishop Azcona Imberto. In 1695 the building was almost finished, with the towers of the façade. In the early 18th century the works were slow, and the first tower was finished only around 1721, the second tower was begun in 1722 and finished around 1725. The main façade was redesigned between 1725 and 1727 by the Italian Jesuit Giovanni Bianchi, the design of the new façade was directly inspired by Italian Mannerist architecture. On the night of May 23,1752, the nave of the cathedral collapsed, the only portions still standing were the façade and towers, but the rest of the building needed to be completely rebuilt once again. The Kavanagh Building is an Art Deco skyscraper in Buenos Aires, located at 1065 Florida Street in the barrio of Retiro, overlooking Plaza San Martín. It was designed in 1934, by local architects Gregorio Sánchez, Ernesto Lagos and Luis María de la Torre, built by the constructor and engineer Rodolfo Cervini, and inaugurated in 1936. Standing at a height of 120 meters, the building is characterised by the austerity of its lines, the lack of external ornamentation, and its large prismatic volumes. It was declared a Historic Civil Engineering Landmark by the American Society of Civil Engineers in 1994 and a National Historic Monument by the Argentine government in 1999. Its construction took only 14 months and was commissioned in 1934 by Corina Kavanagh, the building has a towering form, with symmetrical setbacks and gradual surface reductions. It was created from the outside in, adapting outstandingly comfortable facilities to the space available, the structure was carefully designed to be as slender as possible, in order to avoid unnecessary weight, and influenced by the city planning regulations. Alejandro Bustillo was an Argentine painter and architect who left his mark in various tourist destinations in Argentina, especially in the Andean region of the Patagonia. Born in Buenos Aires, son of María Luisa Madero and Dr. José María Bustillo, he completed his secondary school studies in Otto Krause Technical School. He entered the School of Architecture in the University of Buenos Aires and he graduated with a degree in Architecture in 1914. He obtained his first professional experience working on the design of estancias and he married Blanca Ayerza in 1917, and the couple had eight children. Bustillo designed a house for his own family, Estancia La Primavera. Two years he returned to Buenos Aires, after a visit to Paris, Bustillo undertook two major projects for Carlos Tornquist in Buenos Aires, by designing the family’s house in 1923, and the Tornquist Bank in 1928. From 1924 until 1937 he consolidated his career with a number of works including commercial buildings, private houses. The Martínez de Hoz Building served as the Gran Hotel Argentino before its conversion into the Intelligence Secretariat, in 1938 he began some of his most important works by winning the competition for the design of the Llao Llao Hotel in San Carlos de Bariloche, an important tourist centre. 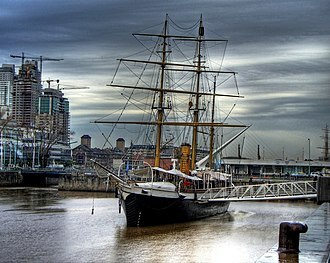 The corbeta ARA Uruguay, built in England, is the largest ship afloat of its age in the Armada de la República Argentina, with more than 140 years passed since its commissioning in September 1874. The last of the squadron of President Sarmiento, the Uruguay took part in revolutions, expeditions, rescues. This ship may be the oldest in South America having been built in 1874 at Laird Bros. shipyard of Birkenhead and this ship is rigged to a barque sailplan. The ships steel hull is lined in teak, the ships namesake is an earlier Argentine Navy schooner, a seven-gun combatant in the Battle of Juncal,1827. Originally built as a gunship, the ship was soon to be used as a training ship, after an episode known as the Mutiny of the Overcoats affected the continuity of studies in the emerging Naval Academy, the ship became a floating headquarters for naval training. In 1879, the gunboat, anchored in Buenos Aires, witnessed the graduation of the academys first class of Naval Officers, in 1884 it transported foreign scientific committees who came to observe a Transit of Venus. In 1887 the ship was removed from its assignment and fitted for expedition support. In 1903 the ship was refitted specifically as a steam rescue ship with auxiliary sail propulsion. Additional bulkheads to create a total of eight compartments and hull reinforcement were added, the bilge keels were removed to facilitate damage-free passage through ice. Hard shell above deck storm and wave protection for crew was added fore, additional insulations of cork and sawdust were added. The rescue effort was led by Lieutenant Commander Julián Irízar who returned from his London diplomatic post of Naval Attache, a special crew of eight officers and nineteen men was selected based upon experience and ability to withstand the severe polar conditions. With all of the expedition members rescued successfully, the ship returned through a storm in a thoroughly battered condition, having been rolled up to 40 degrees. Arriving first at Puerto Santa Cruz, they telegraphed their success to headquarters, the Third French Antarctic Expedition, led by Jean-Baptiste Charcot, was supported by the Uruguay. Clockwise from top: the Polo Stadium, the Galileo Galilei planetarium, the Palermo Woods and the Botanical Garden. The Japanese Gardens of the Palermo Woods. Plaza Italia, a focal point in Palermo Viejo. Cobblestoned street with low houses in the trendy Palermo Soho. The Palace of Congress under construction, 1906. The building seen form Puerto Madero. Tomb of President Bartolomé Mitre. Depiction of the convent by Emeric Essex Vidal, 1817. The convent photographed in 1900. The ashes from Manuel Belgrano's body, after being exhumated from the church's atrium, 1902. View of the convent and Manuel Belgrano's mausoleum (at left). ARA Uruguay near 1903 in Buenos Aires. Panoramic view from the Cordoba Avenue. National Technological University, main campus. Clockwise from top: the Obelisco, the Metropolitan Cathedral, Diagonal Norte and the Colon Theatre. Former Central Post Office on Leandro Alem Avenue. Old silos in the Colegiales district, now upscale lofts. Buenos Aires City Legislature. The Monserrat area houses much of the city's (and Argentina's) governmental structure. Clockwise from top: ARA Uruguay, recycled warehouses made into elegant houses and businesses, the Costanera Sur Ecological Reserve and the Puente de la Mujer. The construction of "dique 2", 1891. The post office under construction (c. 1920).